Callahan is fully licensed in the Commonwealth of Massachusetts. 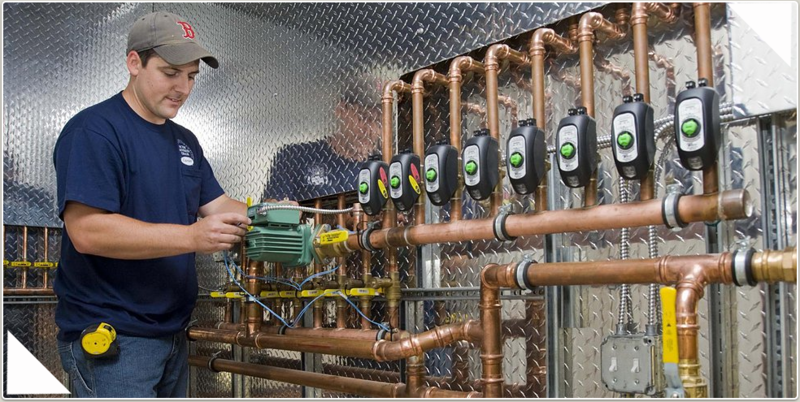 Master and journeyman plumbers are available to meet all routine and emergency needs. Our service vehicles are fully stocked for routine needs and we have same-day access to all types of plumbing and heating fittings. Technicians and office staff receive regular training to keep up on current technology and to improve customer service. We would be happy to answer questions about specific projects and will provide references on request. Please call the office for more information or to schedule an appointment for a consultation at no charge. Thank you for your interest in Callahan AC & Heating Services. Water heating is a thermodynamic process that uses an energy source to heat water above its initial temperature. Appliances that provide a continual supply of hot water are called water heaters, hot water heaters or hot water tanks. Hot water heaters are large cylindrical containers that keep water continuously hot and ready to use. There are many different types of hot water heaters available. To help you choose which type is in your home we have put together a list including photos and descriptions. Contact us to request information or call us at (978) 689-9233 and set up a free estimate.